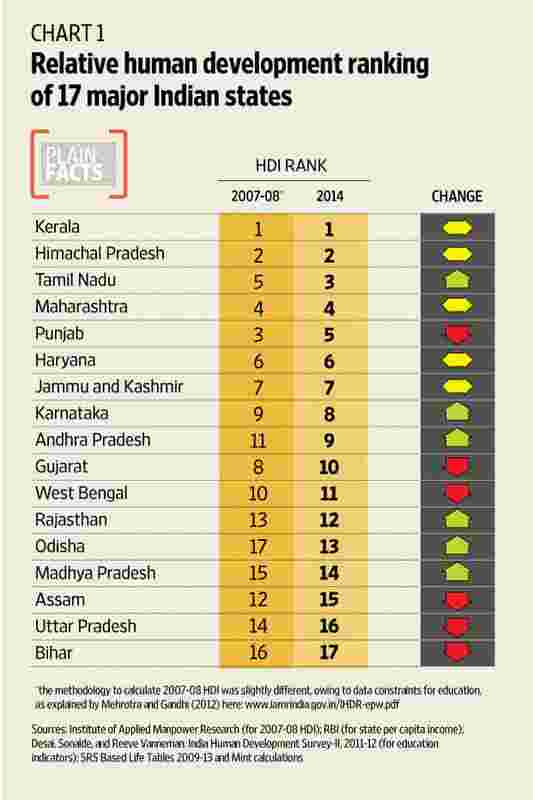 Among the 17 major states of India, Kerala continues to remain at the top of human development rankings. India moved up one spot to 130 among 188 countries in the Human Development Index (HDI) rankings released by the United Nations Development Programme. For a country as vast and diverse as India, there are considerable inter-state variations. Using the HDI methodology to compute rankings for states shows three findings. 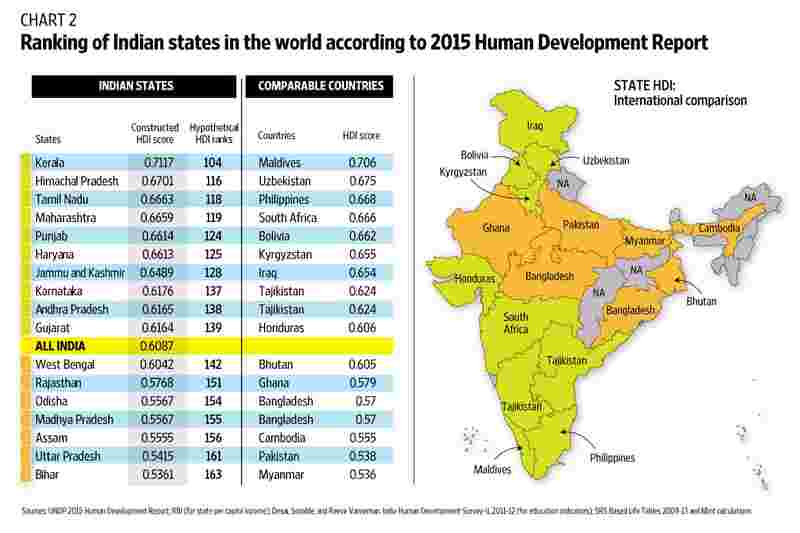 Among the 17 major states of India, Kerala continues to remain at the top of human development rankings (see Chart 1). The southern state retains its top ranking compared with a 2007-08 HDI constructed by the National Institute of Labour Economics Research and Development (earlier known as the Institute of Applied Manpower Research), an arm of the NITI Aayog. The 17 major states of India, with their sizeable population and geographical area, are bigger than many countries in the world. If the 17 states were to be deemed as separate countries, then these would rank from 104 (Kerala) to 163 (Bihar), according to the scores in the latest UN report. Thus, Kerala would be the only state classified by the UN to have high human development since it has a score greater than 0.7 (in a scale of 0-1). The remaining 16 would be classified as either medium or low human development (See Chart 2). Whether growth is necessary or sufficient (or neither) for human development has often been a topic of heated debate. Such discussions have often centred on the issue of the Gujarat model versus the Kerala model. Our calculations point towards two inferences. The relation between per capita income of a state and its social indicators is not strictly one-to-one, but nevertheless is still positive. To elaborate, Kerala remains the best performer among major states in terms of health and education, despite being ranked only fifth in income among the 17 major states. On the other hand, Haryana emerges as the richest state, but is ranked seventh in the health and education sub-index. Thus, high income need not necessarily guarantee the best health and educational outcomes. At the same time, data also shows that the relation between income and social indicators is indeed positive (See Chart 3). The simple HDI measures the relative performance of a country (or a state) on the basis of three parameters—income, health and education. 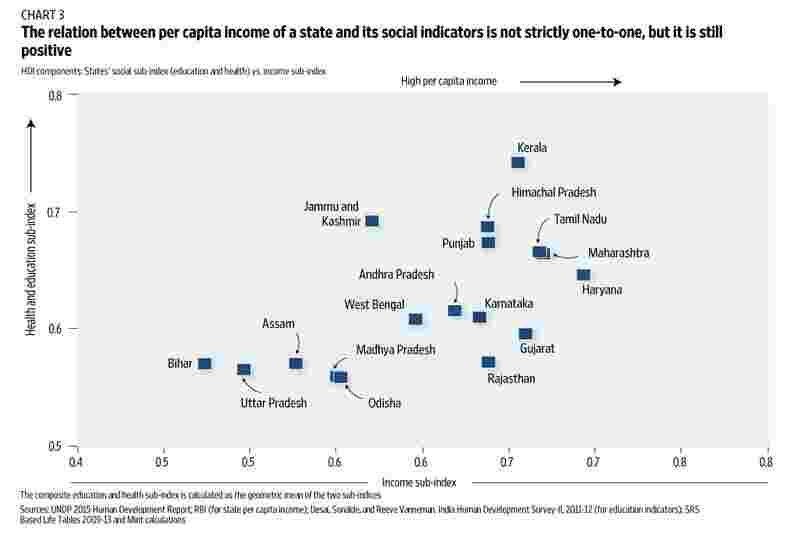 For calculation of state HDIs, per capita income for states is derived from the Reserve Bank of India’s Handbook of Statistics, while SRS-Based Life Tables 2009-13 are used for data on state-wise life expectancy. The education sub-index in the HDI is in turn an average of two variables—expected years of schooling and mean years of schooling. Both the education variables are derived from the India Human Development Survey for 2011-12. The HDI is created in such a way that it can have a maximum value of 1 and a (very unlikely) minimum value of zero. For example, for any country to achieve the HDI score of 1 in the 2015 report, it is required to have a life expectancy of 85, 15 mean years of schooling, 18 years of expected schooling and per capita income of $75,000 (according to 2011 purchasing parity exchange rate). Of course, no country achieved the perfect score of 1, the highest score being 0.944 (Norway). India had a much more modest score of 0.609, while our calculations showed that Kerala scored 0.712.